HE President Toomas Hendrik Ilves and Mrs.Evelin Ilves. The visit will take place at the capital Tallinn and the island of Saaremaa,where HM will visit the city of Kuressaare. The State Visit will see issues as the economic and social development. art from the Soviet era and new art. HM will be Guest of Honour at a reception hosted by the dutch ambassador for members of the dutch community in Estonia. Her Majesty will host a reception and a performance by Introdans at the National Opera on the evening of the 15th. Yes, that's the first lady of Estonia. Here are two pictures, where you can see here dress improve. 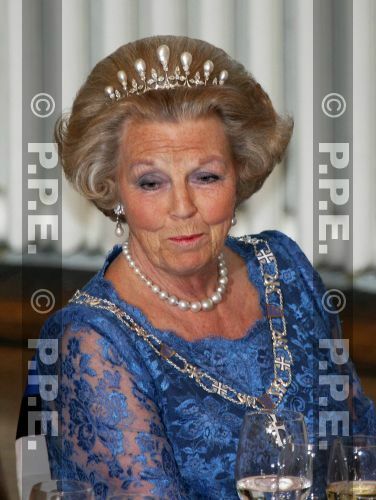 Good to see that HM is wearing a tiara at the state dinner. She did so when she visited Latvia, so I expected her to wear one here too. 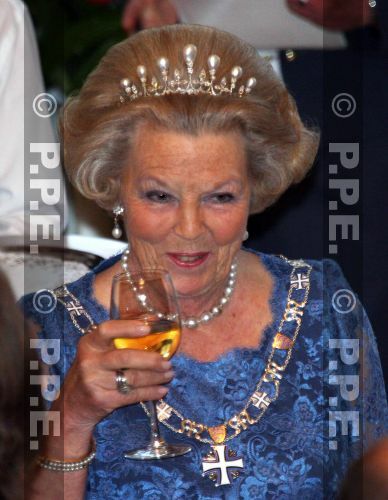 Probably to emphasize the importance of the new EU states, as she usually leaves the tiara at home when visiting a republic (an HM loves these small gestures). Anyway, I the pearl spike tiara come from Russia with Queen Anna Pavlovna and I believe the pearl necklace dates back to Princess Amalia of Solms. It gives me great pleasure to visit your country and to be your guest here this evening. This afternoon we were shown one of the most advanced centres of government in the world, and tonight we are gathered in the mediaeval heart of your capital, a city centre of such great historical significance that it has been inscribed on UNESCO’s World Heritage List. This combination of old and new is typical of your country. On the one hand you cherish an ancient culture, on the other you are completely open to modernity. Respect for the past goes hand in hand with interest in the future. In the course of history, there has been frequent contact between our countries and our peoples have worked together successfully. In the late Middle Ages a lively trade arose in the context of the famous Hanseatic League, which linked the Low Countries with the towns and cities around the Baltic Sea. Later, when our country had become an independent power, these ties became so important that our great seventeenth-century statesman, Johan de Witt, even spoke of the ‘mother of all trades’. Timber from this region was needed to build our houses and ships, and grain to feed our people. In the recent past these age-old contacts have been revived and our economic ties intensified. And the city links established between various places in our countries contribute to the further strengthening of contacts between our citizens. Between that distant past and the present day lies a long and turbulent history that for your country was indeed not without tragedy. Foreign, and often cruel rulers oppressed your people and threatened your culture. But Estonia withstood these trials with great fortitude. Estonian culture was preserved through stories, fairy tales and songs and is still alive and well. Oral traditions have now been recorded in writing. Your compatriots’ love of music shows in their active participation in numerous musical events. The Estonian identity is also expressed in choral music. What is more, Estonia’s voice sounded as the herald of independence in the period that has since become known as the ‘Singing Revolution’. Does she not always a tiara. Also when the dinner is black tie. I think she only didn't wear one to Argenitina etc a few years back. last year in Slovakia she wore also one. But she looks really good. Our girl Trix looks just swell!! Anyway, i agree that HM looks good. Look here for a backview of the dress and in this picture you almost get to see the dress in full length. Nah,Maxima Verhagen is in Suriname,on a two day official visit with J-P Balkenende. Are those 'Maxima's' diamond stars that HM is wearing? Difficult to tell proably as there are two sets of them in the RF. One a gift of the Fuert and Fuerstin of Wied to Queen Wilhelmina but no idea where the other set comes from. HM looked good during the day btw, esp the Orange outfit was nice. Did she wear a daisy pin in her hat? 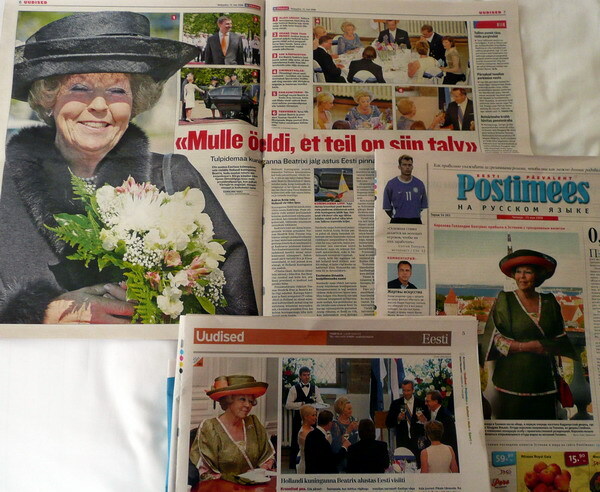 I just read royalblog and HM apparently said to journalists that her agenda with state visits is already planned for the next two years, thus implying that she won' t be abdicating any time soon! And here a clip of the visit by Estonian television.